The cover of all releases are similar and feature three individual black and white shots of the band members on stage (Magne, Morten, Paul). Above and below the pictures are aqua coloured spot lights. The title is in aqua and white letters at the top of the sleeve. A large white a-ha logo has been printed underneath the pictures with "Live at Oslo Spektrum December 4th 2010" printed in aqua below. Both the regular CD edition and the deluxe edition come with a booklet insert although the booklets differ. The CD comes with an 8 page doubled sided booklet compared with the 10 page booklet which comes with the deluxe edition. They both feature the same information and quotes from the band plus track listing and similar black and white shots of the band at their final concert, but the ordering and layout differs. The regular CD edition comes in a jewel case. The back insert features the black and white shot of the band on the edge of the stage and the crowd being covered in ticker tape (the same picture is used on the inside of the digi-pak). The tracks are printed in aqua blue in the top left corner of the sleeve. Additional information, a bar code and catalogue number is printed in white below. The inside of the back cover features aqua coloured lights on a black background, this can be seen through the CD tray. The spines on the CD are black with the titles in aqua and white. One of the spines reads "a-ha Ending On A High Note - The Final Concert", the other reads "a-ha Live at Oslo Spektrum December 4th 2010", all in capital letters. 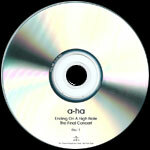 The disc is light aqua with the a-ha logo in large white letters at the bottom and the title in small white and black letters at the top. A gold sticker with white and black text "The farewell show incl. all hits & singles" plus a list of 5 of the tracks and catalogue number has been stuck on the front of the case. The Deluxe edition has the additional "Deluxe Edition" printed in white at the bottom of the front sleeve, it comes in a 4-way digi-pak. The left hand end houses the 10 page double-sided booklet, the two CDs are in the middle and the DVD is on the right hand end. 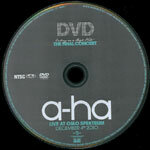 The two CDs are aqua coloured (darker than the regular CD edition) with the disc number and title in white and back at the top and the a-ha logo and "Live at Oslo Spektrum December 4th 2010" in white and black at the bottom. The DVD is of similar design to the CDs, but the disc is black and the text is white and aqua. The "FSK 0" rating is printed on the right hand side of the disc (UK, German and Norwegian editions). In addition, the cover of the German Deluxe edition has a large raised grey DVD rating "FSK 0" sticker in the bottom left hand corner. Once the two ends of the digi-pak have been closed, a black and white picture of the audience getting covered in ticker tape and the band standing on the edge of the stage can be seen across both sides. The back of the digi-pak features more of the aqua lights with "Deluxe Edition" at the top in white and the tracks listed below, the CD tracks on the left and the DVD tracks on the right. The front packaging has a gold sticker (bottom left on Norwegian and UK editions / bottom right on the German edition) which is similar to that on the regular DVD but has the additional text "+Backstage documentary + Photo gallery" and different catalogue number. The German, UK and Norwegian editions are all identical except for the position of the gold sticker on the front and the FSK 0 sticker on the German edition. The UK promo double CD comes in a PVC wallet with a folded paper insert. The front of the paper insert is of similar design to the regular CD release. The back is black with the title in white and aqua at the top and tracks listed in white in two columns. "For Promotional Use Only. Not For Sale" is printed at the bottom of the sleeve. The discs are silver with the title in black at the bottom and promotional text underneath. There is an EU made German promo CD which comes in a cardboard sleeve. It features 16 tracks from the show, excluding "Move To Memphis", "Butterfly Butterfly (The Last Hurrah)", "Crying In The Rain" and "We're Looking For The Whales". The front sleeve is similar to the standard release, but "For promotional use only!" is printed on a faded white strip at the bottom of the sleeve. The back of the sleeve features the black and white shot of the band on the edge of the stage and the crowd being covered in ticker tape, similar to that found on the inside of the digi-pak. The tracks are printed in aqua blue in the top left corner of the sleeve. Additional information, including "For promotional use only - not for sale!" is printed in white below. The disc is similar to the regular release but doesn't have a disc number printed at the top and has the promotional text printed around the edge. The first Brazilian pressing of "A-ha Ending on a High Note THE FINAL CONCERT" was Manufactured and distributed by "Sonopress under license to Universal Music International Ltda", it comes with the same front and back cover artworks as the European release but doesn’t appear to include a golden sticker with black and white text on the front of the CD case. On the back sleeve the white barcode also comes with a different number "6 00753 39185 3" and is now located instead in the top right hand corner. There is an additional "PRODUZIDO NO POLO INDUSTRIAL DE MANAUS CONHECA A AMAZONIA" flying Amazon bird and "Compact DISC Digital Audio" logos included underneath. At the bottom left hand corner of the back sleeve, there is some Universal Music Brazil Manufacturing and distribution text; "Produzido no Polo Industrial de Manaus e distribuido por Sonopress Rimo Industria e Comercio Fonografica S.A. – Industria Brasileira – Rua lca, no 100-A – Distrito Industrial – Manaus – AM. CNPJ: 67.562.884/0004-91, sob licence da Universal Music International Ltda., CNPJ: 08.975.642/ 0001-18. • Denuncie a pirataria: www.apdif.org.br – www.universalmusic.com.br". The Catalogue number displayed on the spine and back sleeve has also been changed to 60075339185. 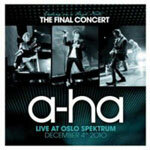 The disc itself comes with a similar layout to the European edition, aqua with black and white printed text, the title; "Ending on a High Note THE FINAL CONCERT" is shown as usual in black and white above the centre ring, with the regular large white a-ha logo and text; "LIVE AT OSLO SPEKTRUM DECEMBER 4th 2010" in black below. A "COMPACT disc DIGITAL AUDIO" logo has also been included at the bottom. The usual "UNIVERSAL MUSIC GROUP INTERNATIONAL" and "WE LOVE MUSIC" logos have been relocated to the right hand side of the disc. Around the outer edge of the disc is the same Brazilian Manufacturing and distribution information which is printed on the back sleeve, but includes some additional Portuguese Copyright text; "TODOS OS DIREITOS RESERVADOS, PROHIBIDA A REPRODUCAO, EXECUCAO PUBLICA E LOCACAO DESAUTORIZADAS SOB AS PENAS DA LEI". The full colour booklet is also included with the album, but at the bottom of the inside back page, there are some additional track ID numbers; "GB-V7Z-11-00001 – GB-V7Z-11—00020" to each track. The album also comes with some additional batch issue coding which is printed in white on the back sleeve (under the barcode) and around the actual centre ring of the disc; AA0001000. There is a second Brazilian pressing which was also manufactured and distributed by "Sonopress under license to Universal Music International Ltda", it includes a golden sticker (but only on the first two AA and AB issues) showing some black and white Portuguese text on the front of the CD case; "O SHOW DE DESPEDIDA! Inclui todos os grandes sucessos: Take on me Stay on these roads Hunting high and low The living daylights Foot of the mountain e muitas outran!". The Catalogue number 60252764845 is also included. The release is very similar to the earlier "Sonopress" pressing and includes the same front and back cover artworks, but on the back sleeve the white barcode at the top right hand corner comes with a different number "6 02527 64845 3". The "PRODUZIDO NO POLO INDUSTRIAL DE MANAUS CONHECA A AMAZONIA" flying Amazon bird and "Compact DISC Digital Audio" logos are again included underneath. At the bottom left hand corner of the back sleeve, the same Universal Music Brazil Manufacturing and distribution text which appears on the first Sonopress edition is shown; "Produzido no Polo Industrial de Manaus e distribuido por Sonopress Rimo Industria e Comercio Fonografica S.A. – Industria Brasileira – Rua lca, no 100-A – Distrito Industrial – Manaus – AM. CNPJ: 67.562.884/0004-91, sob licence da Universal Music International Ltda., CNPJ: 08.975.642/ 0001-18. • Denuncie a pirataria: www.apdif.org.br – www.universalmusic.com.br". On the actual disc, the same format as on the earlier "Sonopress" disc is shown, but includes some additional Production and distributing text to the left of the centre hole; "℗ 2011 CHART PROMOTIONS LTD. UNDER EXCLUSIVE LICENSE TO WE LOVE MUSIC © 2011 UNIVERSAL MUSIC GMBH. DISTRIBUTED BY UNIVERSAL MUSIC DOMESTIC POP, A DIVISION OF UNIVERSAL MUSIC GMBH. ALL RIGHTS OF THE PRODUCER AND OF THE OWNER OF THE WORK RESERVED. BIEM/SDRM. LC 19045". The "UNIVERSAL MUSIC GROUP INTERNATIONAL" and "WE LOVE MUSIC" logos are also positioned to the right of the centre hole, rather than at the bottom with the Catalogue number 60252764845 now on display. An additional "COMPACT disc DIGITAL AUDIO" logo has again been displayed at the bottom. Around the outer edge of the disc is the same Manufacturing and Copyright information in Portuguese which appears on the first "Sonopress" release. The album also includes the same regular colour booklet showing the additional track numbers on the inside of the back page, plus the Catalogue number on the back cover has also been amended to 60252764845. The release as usual also comes with some additional batch issue coding which is printed in white on the back sleeve (under the barcode) and around the actual centre ring of the disc. At least six copies of this Sonopress 2nd pressing are known to exist; AA0003000, AB0001500, AE0000500, AH0003500, AI0000500 and AJ0005000. There is another Brazilian CD release which was instead produced by "NovoDisc under license to Universal Music Ltda." and is very similar to the previous "Sonopress" 2nd release, but comes without the Golden Sticker on the front of the CD case, there is also some slightly different Manufacturing and distributing information on the back sleeve which reads "Produzido por NovaDisc Midia Digital Ltda. Av Guarapiranga, 1671 – Sto. Amaro – Sao Paulo – SP – CNPJ: 02.073.507/0001-09, sob licence da Universal Music International Ltda. CNPJ: 08.975.642/ 0001-18. • Denuncie a pirataria: www.apdif.org.br www.universalmusic.com.br". The usual "UNIVERSAL MUSIC GROUP INTERNATIONAL" and "WE LOVE MUSIC" logos are shown, along with the "COMPACT disc DIGITAL AUDIO" logo displayed under the barcode, but the release doesn’t include the "PRODUZIDO NO POLO INDUSTRIAL DE MANAUS CONHECA A AMAZONIA" flying Amazon bird" logo. The white barcode and Catalogue number 60252764845 shown are the same as the previous Sonopress release. The disc itself comes with the usual layout displaying the black and white title; "Ending on a High Note THE FINAL CONCERT" above the centre ring, plus the same production information is located on the left hand side, with the regular UNIVERSAL MUSIC GROUP INTERNATIONAL and WE LOVE MUSIC logos on the right hand side. The same catalogue number as before is again included. Around the outer edge of the disc is some slightly different Manufacturing and Copyright information printed again in Portuguese; "PRODUZIDO POR NOVODISC MIDIA DIGITAL LTDA. CNPJ: 02.073.507/0001-09, SOB LICENCA DA UNIVERSAL MUSIC INTERNATIONAL LTDA. CNPJ: 08.975.642/0001-18. TODOS OS DIREITOS RESERVADOS, PROIBIDA A REPRODUCAO, EXECUCAO PUBLICA E LOCACAO DESAUTORIZADAS SOB AS PENAS DA LEI". There are at least four issues of this NovaDisc pressing known to exist and again comes with some additional batch issue coding printed in white on the back sleeve (under the barcode) and around the centre ring of the disc;- AK0000500, AL0002000, AM0001000 and AN0001000. The Korean Deluxe edition is very similar to the European edition. It comes in the same cardboard digi-pak but indicates on both the back sleeve and discs that it was "MANUFACTURED & PRINTED IN KOREA". The booklet and discs are the same as the European release, although the aqua print on the sleeve and discs is slightly darker and bolder. The Catalogue number DR6870/276 872-3 on the spine and discs has also been changed, plus the white barcode on the back sleeve is larger and displays a different number "8 808678247756". There is a black and golden sticker on the front sleeve displaying some Korean text about the album and its running format. It also comes with a 3-fold insert. One side of the insert has two black segments with white text, displaying some history of the bands hit singles and album releases translated into Korean. The third part is white with black text and includes some information again in Korean regarding the contents of the Concert being shown on the DVD; the running times are also included. The reverse is white with grey text and displays each track listing (also in Korean) including each track length. The wording "Ending on a High Note THE FINAL CONCERT Deluxe Edition" is printed across the centre in large text. The DVD is coloured the regular black with the usual layout, it comes with an "NTSC" logo in place of the "PAL" one and doesn’t include the "Region 0" logo. The Malaysian edition of "Ending On A High Note - The Final Concert" comes in a jewel case with "Universal Music" engraved on the front of the case in the top left corner. It comes with a folded insert, rather than a booklet displaying inside one page of photos (which is page 10 of the European release), plus the inner back cover track listings page containing some credits. There is a silver "TULEN KPDN & HEP ORIGINAL" hologram sticker in the top left hand corner of the insert. The text "MALAYSIA EDITION" is printed in black all the way round the edge of the front cover. The Final Concert Malaysia disc comes with a slightly bolder colouring than the regular release and includes a different Catalogue number 0602527665771 displayed around the outer rim. There is some additional "Universal Music Malaysia" contact information printed on the reverse of the back sleeve; "℗ 2011 CHART PROMOTIONS LTD. UNDER EXCLUSIVE LICENSE TO WE LOVE MUSIC © 2011 UNIVERSAL MUSIC GMBH. DISTRIBUTED BY UNIVERSAL MUSIC DOMESTIC POP, A DIVISION OF UNIVERSAL MUSIC GMBH • ALL RIGHTS OF THE PRODUCER AND OF THE OWNER OF THE WORK RESERVED • UNAUTHORISED COPYING, HIRING, LENDING, PUBLIC PERFORMANCE AND BROADCASTING OF THIS RECORDING IS PROHIBITED! • ALL RIGHTS RESERVED • CAT. NO: 0602527665771 • LC 19045 • EDARAN OLEH UNIVERSAL MUSIC SDN. BHD (51112-M) G.01 GROUND FLOOR, WISMA ACADEMY, 4A JALAN 19/1, 46300 PETALING JAYA, SELANGOR DARUL EHSAN, MALAYSIA. FOR MORE MUSIC INFO, LOG ON TO WWW.UNIVERSALMUSIC.COM.MY NOW". The regular "UNIVERSAL MUSIC GROUP INTERNATIONAL" and "WE LOVE MUSIC" logos are included. On the inside of the back cover, it has the text; "MALAYSIA EDITION" shown in black on a grey background with the Country’s flag displayed alongside, which can be seen through the front spine of the CD case. There is also a Malaysian digi-pak deluxe edition of the album which was "Made in the EU" and is similar to the European edition. There is no Malaysia Manufacturing information printed on the sleeve or discs, although it does include the regular silver "TULEN KPDN & HEP ORIGINAL" hologram sticker in the bottom right corner of the front sleeve. On the inside the digi-pak, there is no slot to house the booklet, which is just loose inside. The DVD disc is in NTSC format and is grey, rather than the regular black. There is a different Catalogue number 0602527687230 shown on the spine and barcode number on the back sleeve compared to the usual European edition. There is an additional version of "Ending On A High Note - The Final Concert" which includes a single CD plus DVD. It comes in a double CD jewel case. It is similar to the regular European release except for the different track details (the same tracks as the 1 disc CD release) and has a different catalogue number. The Polish release is similar to the Malaysian release. It comes with three different Polish stickers on the front of the jewel case. There is a silver hologram sticker on the reverse plus a small white record company information sticker. Like the Malaysian edition, it also has a folded insert, rather than booklet and has the text "POLSKA CENA ZAGRANICZNA PLYTA" printed around the front of the insert and also on the inside of the back insert which can be seen through the transparent CD tray. The disc is pressed in the EU. It comes with a red and white muzodajnia.pl flyer card. There is a Romanian and Bulgarian CD release of "Ending On A High Note - The Final Concert" which is similar to the Malaysian and Polish editions. The regular front and back cover artworks are used, but additionally printed around the complete outer edge of the front cover in black is a continuation of the text; "UNIVERSAL MUSIC ROMANIA UNIVERSAL MUSIC BULGARIA". The front cover also includes a silver "ROMANIA O.R.D.A. PRODUS ORIGINAL" hologram sticker. Displayed on the inside of the back sleeve, so it can be seen through the front of the spine is a "UNIVERSAL" round globe logo with the text; "UNIVERSAL MUSIC ROMANIA & BULGARIA" printed in blue. On the back sleeve, the layout is the same as the European edition displaying the full track listing in the usual aqua colour down the upper left hand side. The same European Production, distributing and Copyright information is shown; "℗ 2011 CHART PROMOTIONS LTD. UNDER EXCLUSIVE LICENSE TO WE LOVE MUSIC © 2011 UNIVERSAL MUSIC GMBH. DISTRIBUTED BY UNIVERSAL MUSIC DOMESTIC POP, A DIVISION OF UNIVERSAL MUSIC GMBH • ALL RIGHTS OF THE PRODUCER AND OF THE OWNER OF THE WORK RESERVED • UNAUTHORISED COPYING, HIRING, LENDING, PUBLIC PERFORMANCE AND BROADCASTING OF THIS RECORDING IS PROHIBITED!. ALL RIGHTS RESERVED • MADE IN THE EU • CAT NO: 0602527665771 (-70) • LC 19045", but the Catalogue number has been changed. The regular "UNIVERSAL MUSIC GROUP INTERNATIONAL" and "WE LOVE MUSIC" logos are displayed. The layout of the disc is again the same as the European pressing and displays the same Production, distributing and copyright text around the outer edge of the disc which appears on the back sleeve, but again the Catalogue number has been amended to 0602527665771. The album doesn’t include a full colour booklet but instead comes with just a folded insert containing the photos taken from page 10 of the European booklet and the inner inside back page displaying the full track listings with credits included. The Russian 1 disc CD album comes with an obi-strip and hologram sticker in the top right hand corner. The obi strip is black with aqua lights plus text in white and aqua. It includes adverts for Queen albums on the reverse. It comes with a folded insert rather than booklet with a page of photos and the 16 track listing. It is similar to the Malaysian edition, but without the text all the way round the edge of the front. The back insert and disc includes some text in Russian. There is also a two disc (1 CD, 1 DVD) cardboard digi-pak edition. It doesn't specify where it was distributed, but the back cover states that it was made in the EU. The format of the catalogue number suggests that it might be from Russia or it may just be an unofficial pressing. It is similar to the European deluxe digi-pak but with space for only two discs, rather than three. The printing on the CD is a much paler blue than the other releases. The DVD (PAL) is the same as the German deluxe edition, but the quality of the printing is of lower quality. 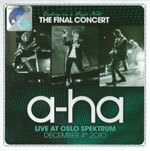 The text "THE FINAL CONCERT LIVE AT OSLO SPEKTRUM DECEMBER 4th 2010" on the disc is in blue, rather than aqua. Also, the gold "Farewell" label on the bottom left of the front sleeve is printed, rather than a sticker. This release doesn't come with an insert booklet, but a couple of pictures from the booklet are used on the flap of the digi-pak. The Taiwan edition is the same as the European release but comes with a large white and yellow obi-strip with black text and coloured Universal logo. The spine of the obi is white with black text plus a picture of a black aeroplane against a yellow circular background. There is an additional catalogue number 276484-5 printed on the obi-strip. There is a Thailand deluxe card digi-pak edition which is similar to the European edition but comes with a matt sleeve rather than a glossy one, it also includes a different Catalogue number 276 872-3 on the spine. The regular Production information on the back sleeve and discs has also been amended to show that the album was "MANUFACTURED AND PRINTED IN THAILAND", plus the white barcode included shows a different number "602527687230". There is a blue "UNIVERSAL MUSIC THAILAND ifpi 599฿" price sticker at the bottom right hand corner of the front sleeve and a white sticker on the back showing some additional Thai text printed in black. Some, if not all of these Thailand releases have "PROMOTION ONLY NOT FOR SALE" printed in white around the centre ring of the two CDs (but not the DVD). The Catalogue number printed around the outer edge of the CD’s is slightly different for each one; 276 484-7 for CD1 and 276484-8 for CD2, whilst on the DVD it shows 276 872-4. The regular booklet is also included inside.